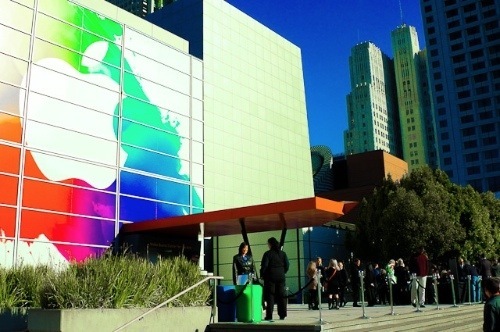 Tech journalists swarmed into Yerba Buena in San Francisco earlier this week to cover the much anticipated Apple iPhone 5 launch. Some news organizations sent multiple reporters, Fortune sent five. That's quite an over kill to cover the launch of a product that turned into an iYawn. The iPhone 5.0 is about 20% thinner and lighter than the previous model, with a slightly larger display. This small improvement in a mass produced consumer product resulted in a flood of news coverage. Yet just yards from where the legions of the tech press were packed into a dark theater for a very long Apple product pitch, Intel, the world's largest chip company, was holding its Intel Developer Conference (IDF) where it was releasing details of its next generation Haswell microprocessor, and discussing where it sees the future of computing. How many stories have you seen about Haswell and IDF compared with the launch of Apple's slightly longer, slightly slimmer iPhone? If you are going to go all out on covering tech products, such as Fortune's five reporters -- surely Haswell is by far the more important news story because it will touch the lives of hundreds of millions more people around the world than any iPhone. Intel microprocessors power the server infrastructure of our digital world. Intel's roadmap for its microprocessors determines the shape of the future. That's an extremely powerful position for one company to hold. Yet it seems of little interest to tech reporters. Tech journalism has become tedious product journalism where printing the spec sheets for mass produced consumer products is celebrated as a great story and where there appears to be little understanding of bigger picture stories about how our digital technologies are transforming our industries, cities, and our societies, at a pace and scale that's never been seen in our history. While tech companies, including Intel and Apple, are partly to blame for the rise of product journalism, because their news releases are essentailly product spec sheets, there's also another factor at work. The impact of digital technologies on the media industry is causing a massive disruption in its business models. The news business has always chased readership numbers but now its easy to tell which news stories generate the highest views and to focus resources there. It's also possible to tie reporters' salaries to pageviews and unique visitors. The rise of pageview journalism now dominates most newsrooms and its effects are seen in the torrent of near-identical news stories that desperately link-bait readers to click on rewrites of corporate pr releases. Where's the satisfaction in that type of reporting? There's no space to develop stories over time, there's few opportunities to educate readers about the importance of key trends, and there's no room for stories on small, up and coming companies because they won't get the pageviews to pay salaries. And by choosing to allow reader numbers to dictate the editorial decisions of the newsroom, publications are losing the ability to standout from competitors. Pageview journalism is creating a bland media landscape where everything looks the same. By miopicly focusing on tech products, newsrooms are missing the bigger picture, that we are increasingly living in a post-technology world, where it's what we do with technology and all our other tools and processes, that matters. We have plenty of "technology" but we've barely scratched the surface of what we can do with it. It's the applications, the way people are changing, how our societies are being transformed, and the new types of businesses being created that make for far more interesting stories than the technology of a product. A change in the size and weight of a cell phone is a waste of time for tens of thousands of journalists. The future is not about technology, it's about our collective ability to harness what we already have, to prosper and to solve big problems. It's easy to confuse innovation with technology but that's a mistake. Innovation is about creating new types of businesses in which technology is but one piece of a far larger story. For example, the iPhone is considered innovative but it's based on technologies that have been around for many years; top Silicon Valley companies such as Facebook or Twitter didn't require the invention of any new technologies to be called innovative. Tech journalism will change but that change is unlikely to come from reporters trained to churn out six product stories a day. We need newsrooms that have the skills to write compelling, high pageview stories, where the 't' of 'technology' represents just one letter among many letters in far more interesting words such as: investment, employment, healthcare, education, cities, culture, and the arts.